Our Top 10 Tips to Win at Online Roulette - Best Tips & Tricks! Betting on the spin of a numbered wheel might be one of the most popular gambling pastimes in the world, but very few people actually know how to win at roulette in a casino. Indeed, have you ever walked into your local gambling den casino, handed the dealer a $100 bill and then walked away? Probably not. The last thing you want to do is part with your money without trying to win. However, way too many punters do just that simply because they don't have a roulette strategy that works. Indeed, despite having all the will in the world, the majority of casino goers don't follow a roulette strategy to win but, instead, simply hand over their money and hope that blind luck will earn them a return on their investment. To make sure you are not one of these misguided players, we've put together the 10 roulette tips that will help you make money wherever you are. Indeed, regardless of whether you want to know how to win roulette online, or inside a live setting, this guide will show you the best ways to make a healthy profit. Here's the thing about roulette: you can make a lot of money betting on one number, or you can win a tiny amount of money by betting on lots of numbers. The more numbers you bet on, the higher your chances of winning. If you place your chip on one number, then the chances of hitting that number are pretty low, so the payout is pretty large. With the same chip, you can split your bet to include several numbers on the board, or an entire row, or a column, or even half the board. Lots of new roulette players make the mistake of dropping money on a specific number, not understanding that it's easier to win by betting on multiple numbers, or playing the outside. Thus, if you want to know how to beat roulette, you need to know how the game works on a statistical level first. Have you ever seen some players alter their bets at the Roulette table based on whether they've won or not? Chances are they're following a specific betting system. There are tons of them out there. Some systems require you to bet more when you lose and less when you win, while others require the opposite. Every betting system is different and some players swear by them. But before you jump on one specific betting system because it worked for some random player, just remember that no roulette betting system has ever been proven to work - no matter what the Internet tells you. Indeed, if you look through all the literature offering tips for playing roulette at a casino, you'll find that much of the betting systems offered are useless. Moreover, even the ones which seem credible (on a mathematical basis) such as the Martingale System, are equally unworkable when you're trying to put together a roulette strategy that works in a real setting. Historically there have been massive wins in roulette because a biased wheel allowed some numbers to pop up more than others. Indeed, when the ball spins and hits the wheel it can cause micro dents which can theoretically alter the ball's movement so that it lands on specific numbers. Additionally, some biased wheels might not be perfectly flat, and this slight directional tilt can result in certain numbers occurring more than others. However, while this phenomenon can happen (although rarely) in some live casinos, it's not something you have to worry about on the internet. Online Roulette wheels use a random number generator to determine the outcome of each spin and not physics. For this reason every revolution and number is perfectly fair and completely random. Therefore, if you're looking to use a series of roulette tricks to discover some bias in an online game, you're wasting your time. Knowing how to win online roulette isn't a case of find fault but sticking to a disciplined betting pattern. When you walk into a big casino, such as the Crown Casino in Melbourne, you know that the operators are legitimate, honest, and trustworthy. However, in the online world things are a bit different. There are hundreds of online casinos to choose from and while some are perfectly fair, some are questionable and it's up to you to spot them. Make sure the site you're choosing to play online roulette at is legitimate and has a strong history of paying happy winners. Sites like OnlineRoulette.com.au are designed to point you in the right direction and preventing you from getting screwed by fly-by-night casino sites. Indeed, if you don't look for signs of a recognised gaming licence, then it doesn't matter what roulette tactics you use, you'll never win. Want to stand out as a good roulette player? Strategy is the key! By learning when and how to make roulette bets, how much to bet, and where to place those bets, you can start to cut your losses and maximise your wins. And there are plenty of roulette systems for you to explore. Check them out on our strategy page. 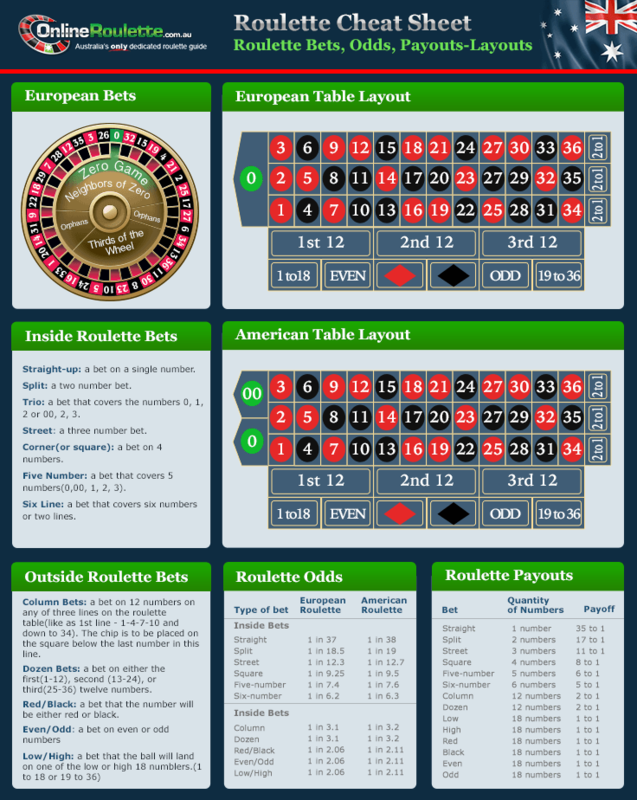 You can see a larger version of our roulette odds chart by clicking the image below, or just download it and keep it with you. Think all roulette games have 38 numbers on the wheel (1 through 36, 0, and 00)? Then you'd be wrong. There are several roulette variations, including European Roulette. The Euro version only has 37 numbers - there's no double zero. But before you get all excited thinking that the odds are way better, you should know that they payouts aren't quite the same. So before you sit down to play roulette online, or live, make sure you understand how much you're able to win and what kind of advantage the house might have. Knowing how to win roulette is just one step on the way to financial freedom. Indeed, if you're unable to implement your winning strategy because the game doesn't offer the correct odds, or the set up of the board is different, then you'll never make a long-term profit. You can lose more than you bargained for when you drink and play roulette. Alcohol clouds your judgment and when you've got money in play you might be more apt to make stupid bets. In the past we've witnessed drunken roulette players betting on evens and odds at the same time. Obviously they break even until they hit a zero or double zero and realise they are extremely stupid. Always keep a clear head when you're playing if you're looking for a way to win at roulette. Have you ever gone on vacation and opted to take the penthouse suite for the week at $10,000 a night, when your budget was around $250 per night? Probably not. That single night in the penthouse likely exceeded your entire vacation budget. Online and land-based casinos are no different, yet some people play the high roller tables at a minimum of $100 or even $500 per bet when they can only afford $10 a pop. Betting more than you can afford to lose is a sure-fire way to lose your shirt fast. Bankroll management is arguably one of the best tips for playing roulette at a casino. Set yourself a budget, choose the most appropriate stakes and stick to a conservative betting pattern and you'll find winning money is a whole lot easier. If you've lost a bunch of roulette spins in a row, you might be due for a big win soon, right? Wrong. Dead wrong. Thinking that you'll win soon because you're due for it is the gambler's fallacy and it's the opposite of the truth. Roulette is random. So is every other casino game. If you want to know how to win online roulette, then it's important that you understand there are no magic roulette fairies waiting to reward you just because you've lost a bunch of money. Knowing this will not only allow you to make smarter bets but have more fun whilst you're doing it. No matter how great online roulette might be, nothing competes with the social element that comes with the really thing. Indeed, because of this even the most diehard roulette players who love to win online often take their game to the offline world every once in a while. Don't be afraid to try roulette in a real casino. The roulette tactics you use online can still be used in a live setting and the physical environment can help you enhance your game through the observation of other player's betting styles. One thing to note is that you need to be prepared for a slower game in the live arena as online roulette plays a lot faster. Casinos aren't charities. Even charity casinos are designed to benefit the charity, not the people playing the game. No matter what type of casino you're playing at - online or land-based - the house always has an edge. Now, that doesn't mean that the house always wins every bet. They don't. People walk away from casinos with thousands, tens of thousands, and even hundreds of thousands in casino winnings. Lots of that comes through roulette wins and players who've followed a selection of pertinent roulette tips. However, at the end of the day, the losers far outweigh the winners so it's important to keep this in mind when you ante up. Overall roulette is a great game to play whether you make any money or not. While we all want to have someone tell us a handful of secret roulette tricks and show us exactly how to win at roulette in a casino, the reality is that not everyone will beat the game. However, if you follow the roulette tips outlined in this article you'll find that making money is a lot more likely. Moreover, you'll enjoy the game a lot more, safe in the knowledge that you know how to beat roulette when luck is on your side. Like these tips? Put them to the test at your favourite online casino. Don't yet have a favourite site? There are tons to discover so take a look around and find the perfect Aussie online casino for you.